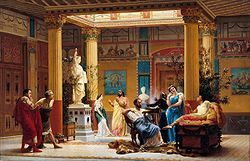 Gustave Boulanger, A Performance of The Fluteplayer in the Roman house of Prince Napoleon III, 1861. Painting of scenes or events from everyday life, of ordinary places, people (with no specific identity attached) and their activities, dresses, a variety of objects, depicted in a generally realistic or romanticized manner or in a not idealized subject matter. Genre painting themes have appeared in nearly all art traditions. Flemish Baroque painting and Dutch Golden Age painting dominated the field until the 18th century. The hunter by Emil Rau, 1889. Francisco Díaz de León, Mañana en el pueblo de Ozumba, ca. 1922. Peter Baumgartner, Amorousness, ca. 1911. The Feast of the Gods by Giovanni Bellini, ca. 1514. The Cardsharps by Caravaggio, ca. 1594-1595. The milkmaid by Jan Vermeer, 1658-1660. The Jewish Bride by Rembrandt Harmensz van Rijn, 1667. The Lacemaker by Jan Vermeer, 1669-1670. Resting travellers by Adriaen van Ostade, 1671. La Gamme d'Amour by Jean-Antoine Watteau, ca. 1712. The Balcony by Edouard Manet, 1868. Mein Nest ist das Best by Adrian Ludwig Richter, 1869. The Harem by Fernand Cormon, 1877. The Woodcutter by Camille Pissarro, 1879. The Potato-Eaters by Vincent van Gogh, 1885. Diego Velázquez, Las Hilanderas, 1657. A Peasant Boy Putting on Bast Shoes by Alexei Venetsianov, 1823-1927. Barge Haulers on the Volga by Ilya Repin, 1870-1873. Easter Procession in the Region of Kursk by Ilya Repin, 1880-1883. Acrobat and young Harlequin by Pablo Picasso, 1905. Bread by Tetiana Yablonska, 1949. Winslow Homer, Perils of the Sea, 1881. William Merritt Chase, Seated Figure, 1881. This page was last modified on 7 May 2014, at 10:04.